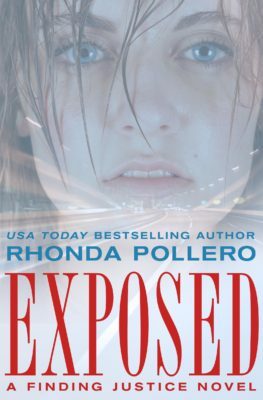 Exposed by Rhonda Pollero is here! This romantic suspense is the first in her new Finding Justice series! Be sure to enter the giveaway, too! First comes love, then comes fear . . .
After a whirlwind romance, Darby Hayes Grisom married the man of her dreams. Smart, handsome, ambitious-Sean was everything she always thought she wanted. Little did she know that one year later that dream would turn into her worst nightmare. Sean is moody, angry, violent. Violent enough to kill. When Darby realizes she’s pregnant she knows Sean will never let her go. Attorney Jack Kavanaugh is the only person Darby can trust to help her with her plan to save herself and her baby. But the deeper Jack gets involved in protecting Darby, the deeper the feelings between them become. A complication Darby can’t afford-because her husband is watching their every move and he’ll do anything to get her-and their baby-back. “Let’s step into the hallway,” Sean suggested, placing his arm around the shoulder of the officer, guiding him out of the room. Darby slammed her head against the pillow and again hot tears welled in her eyes. Grabbing the call button, she pressed it over and over until a petite and clearly irritated nurse entered the room. In the split second the curtain was drawn back, Darby saw Sean and the sergeant sharing a handshake. “Yes?” the nurse asked as she gave cursory glances to the machines tethering Darby to the bed. “Not him,” Darby cried. Too late. Sean and the officer returned. It didn’t take a rocket scientist to see that the sergeant was totally charmed by Sean. The sergeant took up a position at the end of her bed next to the nurse while Sean moved to the head and draped his arm around her shoulders. “I was just explaining your condition to the policeman.” His fingers dug into the flesh at her shoulder. Darby pressed her lips tight. “Roxanne would lie for you,” she whispered under her breath. The nurse followed Ciminelli out of the room. Darby braced herself, fully expecting to suffer the wrath of Sean. Instead, he was just looking at her as he arranged the hair framing her face. “I’m sorry, sweetheart. I always liked your parents,” he whispered against her ear.